Want to send back money home? 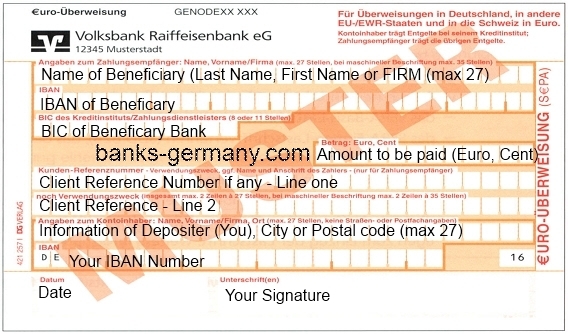 You can make an international money transfer from your German account. Depending on where you want your money sent, you have different options to use for an international money transfer. Within the EU, including Switzerland, Iceland, Liechtenstein and Norway, a simple enough SEPA or an EU standard transfers, so that the amount to the bank account will be credited to the recipient. The forms are similar to those of a domestic transfer to be filled in the same way: receiver including bank account details, amount, purpose, and together with the bank account holder. A SEPA transfer form translated into English is provided below for reference. Would like to know the fees for transferring money-IN to my account from a US bank. I need to find a bank in Germany where I can transfer money from A broad with minimum charges ,as I will be paying the transfer charges .